Welcome to the Wayne and Shuster Tribute, celebrating the Legacy of Johnny Wayne and Frank Shuster. The sad part is that the CBC are rarely playing Wayne & Shuster on Television anymore. Mary Depot of the CBC has been active in keeping them on TV, and Wayne and Shuster, The Legacy Collection is a series of specials that have been put together to keep the boys' memories alive. This is the second program and it occured on June 14, 2008. Bits included Kwai Me A River, the Frontier Psychiatrist sketch, the Tower of Pisa sketch, Mutiny on The Poop Deck and Rinse The Blood off My Toga, which was presented as the last half of the program. There are also some short bits from their B&W years. Unfortunately, all of the bits presented are shorter and edited. The first program in this series, Volume 1 was broadcast well over a year ago. I am assuming there will be more in this series, but I do not really know. If I get any more information on The Legacy Collection, I will post about it here. It has been a while since there has been any kind of update on this site. I recently recieved an email from a Leanna Brodie. She pointed out that her late father, who was part of the series, is not on the list of series players on the site. I have added his name there. He was the one who played McDuff in the Shakespearean Baseball Sketch. A special thanks to Leanna for taking the time to alert me of this error. I was recently notified by the folks who have been providing the Guestbook for The Wayne & Shuster Tribute, that they will be discontinuing their free Guestbook services very soon. I think however that I have found a suitable free online Guestbook service for people to continue posting to in the future. I have the old messages from the previous Guestbook posted in a Guestbook Archive. Hope you like the new Guestbook. A Special Thanks to Spin Guestbooks for all the service they provided over the years. I have taken the time to revise the website so that it will work properly in the latest version of Internet Explorer, IE 7. If you were here on Sunday, February 11, 2007, you may have had a hard time viewing the site, due to the maintenance. Apologies for any inconvenience. Let me know if you have any trouble with viewing the site in your browser. Thanks. David Hawkins who works with me on my Benny Hill site has found out a little info on two shows that Johnny and Frank made in the UK, but they were only put out in the north-west of England. We have no details about the shows other than the release dats. The programs were made by Granada for ITV. Thanks for the info, David. • Wayne & Shuster 10/July/1969 60 min B&W. • Wayne & Shuster 17/July/1989 60 min B&W. David Hawkins also found out about three other programs the boys made in London. James Gilbert was the producer. Although there are no cast details for the first show, David does know that the other two programs main cast included The Dudley Moore Trio and Una Stubbs. • Wayne & Shuster 22/Dec/62 Sat. at 8pm on the BBC. 45 mins. B&W. • Wayne & Shuster 4/Sep/65 Sat. 8.30pm on the BBC1. 50 mins.B&W. • Wayne & Shuster 25/Sep/65 Sat. 8.30pm on the BBC1. 50 min. B&W. Due to some requests, I have written a petition for you to sign to see to it that the Comedy Network brings back Wayne and Shuster! So show your support by signing the Please bring back Wayne & Shuster to The Comedy Network Petition. The newest technology for getting the latest news & updates is the syndicated news services. This makes it possible for you to subscribe and get the latest updates to my site without even having to visit. The button (at the top of this paragraph) is also at the top of every page so you can subscribe. Please feel free to pass along any feedback about this service. There are plenty of News Reader programs on the internet you can download to take advantage of this free service. Enjoy! RSS (Really Simple Syndication) news feeds allow you to read only the news you want, when you want. You will need to download a news reader or an RSS web module of your choice, click the RSS button above and copy the appropriate link from the linked page and paste it into the news reader software. You can also take advantage of Web-based News Readers without the need to download a reader into your computer. An excellent example is the services provided at www.pageflakes.com which can also provide the news feed for my site and just about any place on the internet that provides news feeds and podcasts. I apologize for not having an official Guestbook for this site before. Please feel free to leave any messages, thoughts, comments or suggestions there. I look forward to your feedback! Please remember that this is not an official site for Wayne and Shuster! 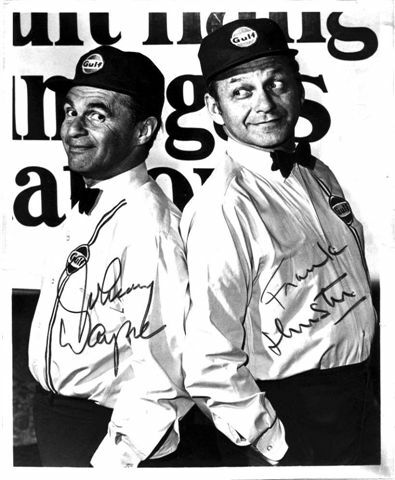 Wayne & Shuster fans Dave and Michelle Dewing were kind enough to pass along this scan of an autographed photo of Johnny and Frank in an ad for Gulf Oil from the 1960's. Just click the photo to see a larger version. If anyone has any info on this ad, please pass it along. Special thanks to Dave and Michelle for the scan. 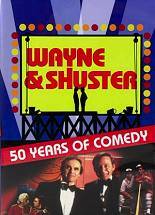 Wayne & Shuster 50 Years Of Comedy DVD! This looks like the first Wayne & Shuster DVD Ever! Released on September 6, 2005. This is a program that was on TV a few years back which Frank Shuster hosted. It's a 76 minute program featuring a series of clips from the years that Johnny & Frank made Candians and people around the world laugh. I do plan to get myself a copy and do a review of the DVD on this site. This is also a region-free DVD. Wayne & Shuster Tribute at Google Groups! You can now become a member of the Wayne & Shuster Tribute Google Group by simply registering. You can discuss your memories of Johnny & Frank there. Enjoy! I have now removed the Wayne & Shuster Tribute completely from Yahoo! Geocities, except for a page to redirect you to this webspace. There are several reasons why I have done this. One, ease of updating, since I have ftp access to this space. Two, all of my websites are now in one easy to access location. Third, and most important of all, to rid my sites of all advertising! I recently discovered that when you directly link from Yahoo! Geocities to any other page on the internet, the Yahoo! advertising still appears in your browser window and their url continues to display in your white address box! If you have a website on Geocities that directly links to other pages on the internet, I urge you to check this out for yourself. I am sure you will agree that this is an underhaned way that Geocities is forcing you to look at their advertising, even after you have left any websites that are placed there. Welcome to the Wayne and Shuster Tribute, formerly Wayne and Shuster Online. The site now has a new layout and utilizes XHTML to make the pages more compatible with more browsers. The pages should fit just about any size monitor as well. Note: For those who have trouble reading smaller print, use your browsers text size adjustment as this site will now display larger text if you so wish. Hopefully traffic will pick up on this site. If not, I may decide to move it. Enjoy! They were described as "literate" comics who were "good companions". Johnny Wayne and Frank Shuster were staples of the Canadian entertainment industry for 50 years. They started out in radio and eventually moved on to television. They made a record number of appearances on the Ed Sullivan Show and became famous for their specials every Sunday on CBC Television. They started with programs in Black and White, and many of their Black and White shows can now be seen on CBC Television in a series put together by Frank Shuster, "Wayne and Shuster in Black and White". The black and white shows were a little before my time. I remember them for their series of color programs which they made throughout the 1970's and 1980's. I can remember my whole family making a point of watching their specials on CBC on Sunday evenings, going under various names like "The Wayne and Shuster Super Special". They did commercials, movie parodies, including a send-up of "The Godfather" and "Rocky". However, they are most fondly remembered for sketches like "Rinse The Blood Off My Toga" and perhaps their most famous sketch, "The Shakespearean Baseball Game". When Johnny and Frank went to Television, they started out with shows that ran once a month as a 1/2 hour progams from 1954 to 1957 and then from 1962 to 1967. They also did one hour specials which aired at the beginning of each season from 1968 to 1989. The specials they made during the 70's were put together as 30 minute shows to run just before Hockey Night in Canada in the 1980's. Over the years they would repeat a certain sketch, like the baseball one, and I feel that they actually refined and improved upon the originals this way. They were also capable of keeping up with the times by doing sketches like "Saturday Night Feeble", spoofing famous disco films during the 1970's. They were never interested in going to the US and Hollywood. They preferred to raise their families in Canada and continued working with the CBC over their long careers. They stayed just the way they were from the start. Two fellows looking for some "innocent merriment". With this site, perhaps a whole new generation can learn about the pioneers of Canadian comedy. Before The Royal Canadian Air Farce, SCTV, The Frantics, Kids In The Hall, Codco and This Hour has 22 Minutes, there was Wayne and Shuster.